We're sure that you are all really thrilled by the impending arrival of Cars 3: Driven to Win on Nintendo Switch, and we know now the UK release date thanks to its listing on the Switch eShop - it arrives in the UK on the 14th July, costing £49.99. What's interesting is that the boxed retail version of the game will be exclusive to UK retailer Argos, and priced at £39.99 this is better value than the eShop version. Who knows, it might even become a collectors item one day! 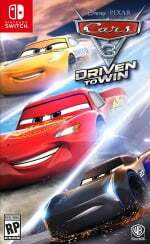 In this movie tie-in game you'll join Lightning McQueen and Cruz Ramirez as they prepare for a rematch against rival racer Jackson Storm. You'll get to train and advance your abilities of two-wheel driving, barrel rolls and more in 6 thrilling game modes. In North America it appears the game will be sold in all the usual places, including Amazon of course. It'll be out a month earlier in the US too, with the game screeching into view on 13th June. Will you be picking up Cars 3 for your Switch? Let us know with a comment below. Weird, it's quite rare for games that aren't even collectors editions to have exclusivity nonsense in the UK. A tie in game for Cars 3 that's not a free-to-play money grabber? Sounds great! How much is it? I would actually play a cars game that was a moderately decent racer. Kind of a missed opportunity if you ask me. "What's interesting is that the boxed retail version of the game will be exclusive to UK retailer Argos, and priced at £39.99 this is better value than the eShop version." I noticed it was exclusive a few weeks ago. Really strange. I might consider it, depending on reviews and the movie, when it's a lot cheaper and if I'm still working at Argos, for the discount. "Who knows, it might even become a collectors item one day!" The boxed Sega 3D Classics was also an Argos exclusive in the UK - is this the start of something bigger from Argos? I wonder what kind of benefits they (both Argos and the publisher) are getting from it. Is it just me or does the graphics on this look...off? I mean, there is nothing wrong with them precisely but it feels...soulless. I'd say based on their choices of limiting release for a game like this, it should be called "Cars 3: Driven to Fail"
Cars again ? On 6 different consoles ?? Disney version of Initial D.
Talk about limiting your chances of success. Anyone remember Wacky Races on the Dreamcast?That was a great game.I'd completely forgotten about it until today,I was writing a list of my top 10 games in the forum and from nowhere,that fantastic racer came to mind. This is just another reason for the devs to moan when games don't sell in the numbers that they should. I never understand limiting the sales of a standard box game to one retailer, unless the game is garbage and the dev's not expecting the game to sell well anyway. Luckily for this American dweller, I can easily pick this game up from a local Target. And ugh. The light sarcasm in this article is killing me! The Cars games are actually very good! They aren't like most movie tie-in titles. Don't be so hasty to judge! @Grandpa_Pixel The graphics certainly look dated. I mean, unless this video was recorded on a PS3, it definitely does not look like a game to be released in 2017. Then again, Disney Infinity never looked great, maybe they've not done much to the engine? Frustrating that a retailer can have exclusivity of a title. We want as many consumers as possible to see the range of games available for the Switch! I am not sure what to make of this game. The previous entries have been okay, but historically my children preferred Sonic Racing Transformed and MK8 over the previous entries in the series and the Cars games have not got much use. I'll stick to MK8 unless this has that open-world feature. This is weird, because when was the last time a movie tie in was released on a console and not the App store? Easily the worst Pixar franchise and I don't even want to watch the film let alone play this crap. @ClassSonicSatAm: The open world was the best part of Race-O-Rama! @Angelic_Lapras_King: And the Wii U version is $10 cheaper than its Switch counterpart. @Malcrash The Cars 2 game is precisely why I'm telling people not to sleep on this. I honestly think that game does some things better than Mario Kart (particularly in single player). Considering they are $50 on Amazon you might be right. @Phin68 The cars 2 game was pretty good and at the time my son and I had fun playing it, but we played MK and Sonic Racing Transformed so much more. Just the other day, my daughter asked me if I wanted to sell it. It still has memories attached to it because of my son, so I do not want to sell it yet. But Cars 2 just did not have something that those other "kart" racing games had. I am not sure if I can put my finger on it. But once my son was done with it, he never went back. But Sonic Racing Transformed and MK, both Wii and 8, we played again and again. @Grandpa_Pixel It's just a rush job to get it released alongside the new Cars 3 movie. Like so many movie based games. 99% of the movie based games are total crap, hence why these games have a bad reputation. Even less people will buy it now. I just can't get over that the cars in a racing game are saying "ouch!" when you hit something. @OorWullie Yeah, I had it on PS2. Adored that game, me and my Sister would play it for hours on end. Definately my favourite racer behind Mario Kart! The question is: "But Mariokart?" Well the first two Cars games were pretty good so I'm slightly looking forward to this one. Although, it looks too similar to Cars 2. Also, isn't it weird how this game is being developed by WB Games? If this game is exclusive to Argos why did Toys R Us have it on their shelves today??????? ?